45 Grave is known for being one of the innovators of goth-industrial, yet until very recently, the band’s catalog boasted of only one studio album and a couple of singles. 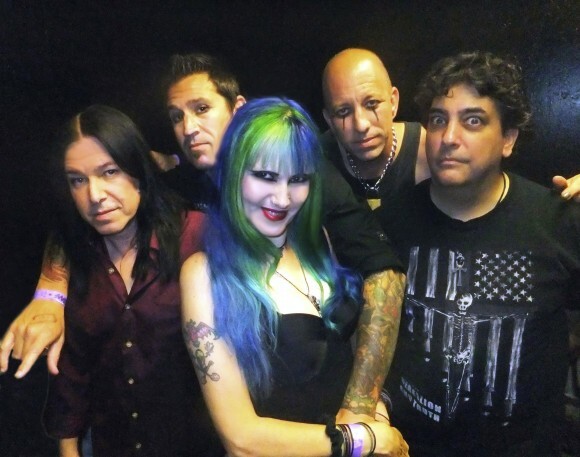 Pick Your Poison was recently released by Dinah Cancer and a whole new lineup that’s she’s spent a lot of blood, sweat and tears putting together. She’s tried her best to pick up where 45 Grave left off, ignoring the 20-year lapse and enthusiastically moving forward. I had the opportunity during the recent Sunset Strip Music Festival to chat with her about it. mxdwn: So you guys have a new album out called Pick Your Poison. It was a bit of a wait since the last one, right, nearly 20 years? Dinah Cancer: Yeah the album was released on Frontier records on August 14th 2012. It’s available for download, vinyl, and CD. You can get it on Itunes or amazon.com. We’re infesting everything. It’s about time, let’s get it done! Well it’s hard to fill the shoes of 45 Grave. I was trying to find the perfect mix of people, and in the last ten years I put up a really hard fight. I’m really excited with my present lineup of Frank Agnew, Brandon Blackwell, and Tom Coyne because they’re about the best equivalent to the original lineup. It’s very hard to find a person to fill Paul Cutler’s shoes and Frank Agnew actually does it. He’s Rikk Agnew from Christian Death’s brother right? How did he end up taking his brother’s spot in 45 Grave? Actually Rikk played with me for a year and he actually had some other bands he was working on. I’m an official Agnew so both Frank and Rikk are my brothers. I have the name now. I’m going to legally change my name to Agnew because they are my family, actually Rikk is here. I’ll introduce you. The whole family is out today. Rikk is still very much a tight member of the family and I’m very happy that he’s here today because today is Frank’s birthday. The family got together and were going to give him a cake. Everyone’s like, “Why don’t you throw it at him during the show?” but I think I’d like him to be in a better mood. Are you guys planning a tour? Actually right now we’re looking into it. We’ve been very up on doing the PR and everything for Pick Your Poison. I’m hoping by the beginning of next year we’ll be able to do a full tour. Everyone’s been asking me and yes I’ve noted it. We want to put together a really cool show that’s more theatrical so we’re taking time out right now to work on the stage show. The new album is almost more rock ‘n’ roll than goth, in a way. Was that intentional? A lot of people have asked me what made me Dinah Cancer. And back in the day I didn’t have Bauhaus. I didn’t have Sisters of Mercy. I didn’t have any of those bands. I basically had Judas Priest, Ozzy Osbourne, Alice Cooper and basically the new album Pick Your Poison is kind of where 45 Grave was in the way we were writing music around the time the original lineup had broken up. We were actually starting to go more into the rock ‘n’ roll, metal, punk type of deal. The song “The Sorceress” was one of the last songs we wrote together as a band and we recorded it on this album and same thing with “Akira.” We wanted to celebrate the period of time when were originally were out. So you have a couple of the old, a couple of the new. That’s why we are really looking forward to writing a completely new album in the fall. We’re going to start writing really soon. We want to do 15 songs instead of 10. We want people to know we’re totally active again. So I saw the video for “Eye of the Demon.” and it’s awesome. Any more videos coming out? We really enjoyed doing that one, it’s like a mini horror movie and right now we’re slated to do 4 more. I’ve asked the question before of artists who I think get labeled with this term: How do you feel about the word “goth”? I was part of the post punk 1977 generation I’m proud of goth, but I still consider myself more death-rock or horror punk. I fully support everything that everyone is doing though. Both us and Christian Death, Rick will love this, we are in the Grammy Museum as being the innovators of the goth-industrial genre. It was kind of neat to find that out and know we actually did something.